And who gave you the right to scare my baby? She needs me! And who gave you the right to take, intrusion? To see me! And who gave you the right to hurt my baby? She needs me! The ghost of jealousy Come on! Ok, I decided to put something better and more useful then what I had before. This page has the complete dialouge from Ghosts without the songs. This came out of a Black & White issue. Older brother: Why don't we just leave him alone? Jerry: He hasn't hurt anybody, can't we just go? Older brother: It's your fault Jerry, you just couldn't keep your mouth shut. Mother: He did the right thing. Mayor: He's a weirdo. There's no place in this town for weirdos. Man: You see that, that, that ain't a good sign. Jerry: Just like last time! It's the ghost! Mother : Don't hit your brother! Mother 2: There's no such thing as ghosts, honey. Mayor: Gonna prove it to you, kid. Let's go. Woman: Did anyone call and make sure this is a good time? Maybe we should come back later. Woman 2: Yeah, like when it's light out, you know, like daytime. *MJ*: Did I scare you? Mayor: No, you didn't scare me. Maybe you scared them but you didn't scare me. *MJ*: That's too bad, isn't it? I guess I have to try harder next time. Mayor: There won't be a next time. *MJ*: No next time, huh? Why is that? Mayor: We want you out of town. We have a nice normal town, normal people, normal kids. We don't need freaks like you telling them ghost stories. *MJ*: So you don't believe in ghosts? Mother 2: Hush up! You se what you've done! Aren't you  ashamed? Young people are impressionable. Jerry: Show'em the neat stuff you did for us! Older brother: Shut up! That's supposed to be a secret! Mother: Don't hit your brother! Mayor: You're weird, you're strange and I don't like you. You're scaring these kids, living up here all alone. Man: I don't wanna hurt nobody. *MJ*: You're trying to scare me, aren't you? I tell you what, we'll play a game. Anybody here like games? Hello! Game time! 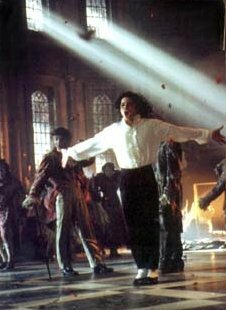 *MJ*: The first person who get scared has to leave. How about that? Mayor: I don't play games with freaks. *MJ*: There's no need to be rude. Woman: Yes, I agree, there's no need to be rude. You have a very lovely home but I'm afraide we overstayed your welcome, wo we're gonna go, okay? Can we go? Mayor: Are you gonna leave or am I gonna have to hurt you? Man: I don't hurt nobody. 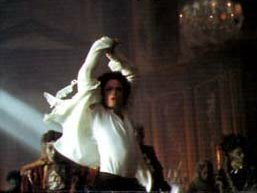 *MJ*: You are trying to scare me! I guess I have no choice. I guess I have to scare you. Watch this... Tell me, do you think this is scary? Mayor: That's ridiculous! That's not funny. *MJ*: Okay, fine. What about this one? *MJ*: Are we going somewhere? Hello! It's too late! You're my guests. And by the way, did I tell you I wasn't alone?... Meet the family! *MJ*: Are you scared yet? MJ controling Mayor: Who's scary now? Who's the freak now? Freaky boy! Freak cirsuc! Freak! Who's scary! Who's weird now? *MJ*: SO, you still want me to go? Mayor: Good riddance! Let's go. Let's go! Let's go! I showed that freak. Woman 2: For a minute, I thought I was going to lose it. *MJ*: But did we have a good time here? Hello? Jerry: Did I scare you? Older brother: Excuse me, excuse me. Yeah, huh... Is this scary?